As I mentioned last week, we decided to refinish the hardwoods before moving in. Boooo for the checkbook, yay for the floors! As you can see in this snapshot, the previous owners left a few scratches from their own sweet pets. We decided to make the plunge and enjoy the opportunity to scratch newly refinished hardwoods ourselves. Why scratch floors that are already marked up? There's no fun in that. It's much more interesting to spend lots of hard-earned money and watch your dog scratch them twice, really bad, in a week. (Not that I know what that's like or anything...). Ha! So I'm thinking, this is an opportunity to make this minor upgrade that (I think) makes a big difference aesthetically, for the money. It was probably a difference of about $300 for two newel posts, versus them replacing them with the same style we had before. I showed inspiration photos to our hardwood guy who very fortunately had two on-hand! 1. Box newels look a little less "builder" to me than the style that was installed (I'm not talkin' nasty about "builder" homes. HEY. We all have builder homes! But you guys know what I'm sayin....). 3. Antique or custom newels would have been wonderful, but I didn't have the budget or time to investigate that as an option. Ready for a look at the "almost" after? I'm really happy with the result so far! And I love the hardwood color! 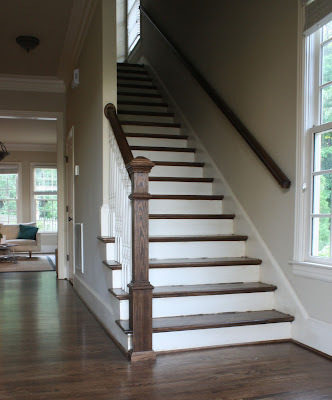 Yup, my friends, there was a LOT of mess (hardwood stain that was slopped onto the trim) on the stairs, all over the trim and even the doors and door frames. Fortunately, the hardwood company is paying to have them repainted. I'll try to keep you posted on that. So what do ya think? Agree with the update? 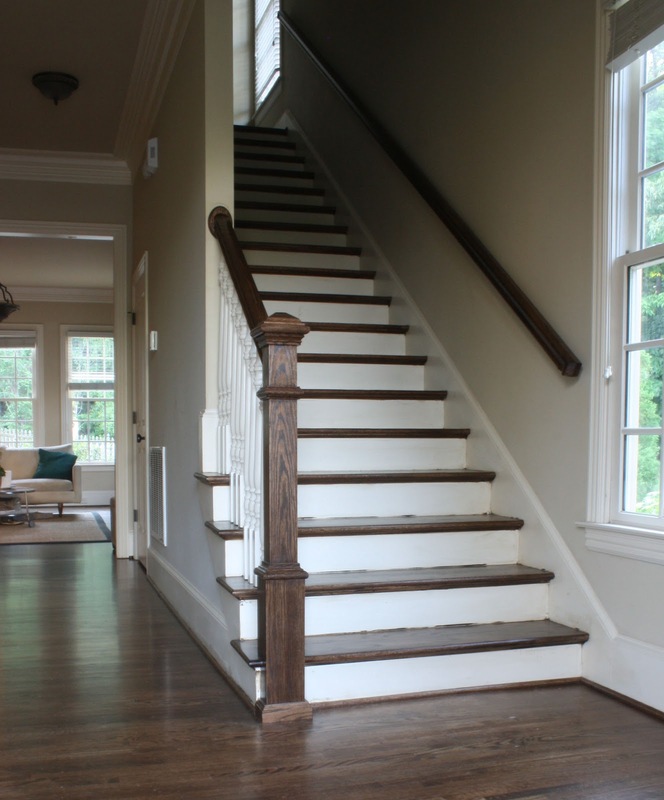 Do you have a preference about newel styles or stair rails? 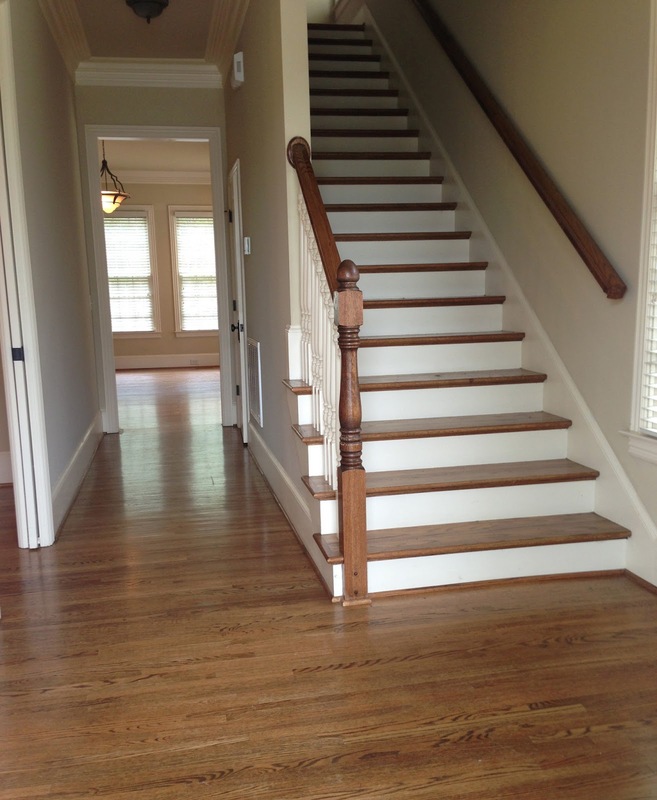 Do you have any experience with hardwood floor refinishing--good or bad? Thank you Ericka! I can't wait to see yours too. 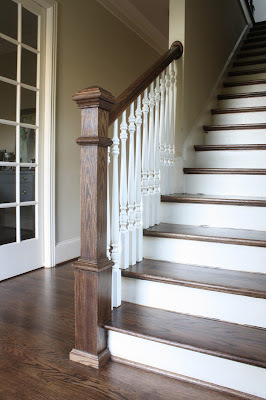 I LOVE me some newel posts, and those are AWESOME! 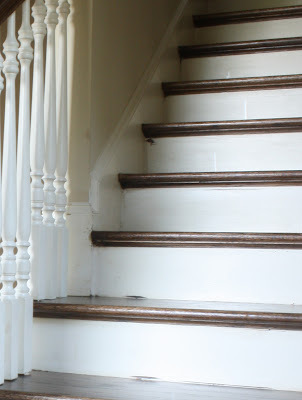 The house I grew up in had a staircase that looked very similar, and man do I miss that thing! Thank you so much! We really are pumped about the progress. I would love to see the staircase from your childhood home. The leftover of a nail can tear up sandpaper, harm a sanding cushion, and do genuine Hardwood floor refinishing harm to the palm of your hand, so check painstakingly to verify all remainders of tacks and nails are gone before you start sanding. Fill all nail gaps with a quality wood filler, matching the color as nearly as possible, and let it dry. At that point you're prepared to start sanding the floor with 220-coarseness sandpaper, whether by hand or with a sander.